Sometimes a tooth is lost and the patient is faced with what to do to replace it. All our teeth are important for chewing, speaking and looking our best when we smile. Fortunately, there are several options to consider. One option is the dental #implant. An implant is much like a natural tooth because it is anchored in your jawbone then restored with a crown. An implant is actually a metal post placed into the bone in your jaw and acts like the root of a tooth. Then the dentist makes a replacement crown on the metal post. Another alternative to replace missing teeth is a fixed bridge or #FPD. An artificial tooth or teeth replace the lost natural ones. Crowns, which are cemented on adjacent prepared natural teeth, serve as retainers that support the fixed bridge. The fixed bridge can only be removed by your dentist. The third option for replacing missing teeth is a removable bridge or #RPD. It can be taken out of the mouth for cleaning. They are made with replacement teeth attached to gum-colored plastic bases connected by a metal framework. They attach to your natural teeth with metal clasps or devices called precision attachments. 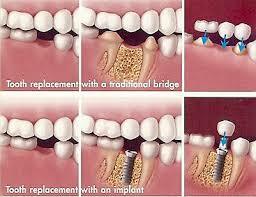 Although removable bridges are less expensive, fixed bridges, when indicated, may feel more stable and natural. It is advisable to explore your options for replacing missing teeth with your dentist. It is an important decision and will help you look better and improve the functioning of your teeth. Give us a call or stop by for a consult if you or a loved one are needing replacement of a missing tooth.